I'm happy to introduce you to this darling, Australian shop called 41 Orchard. 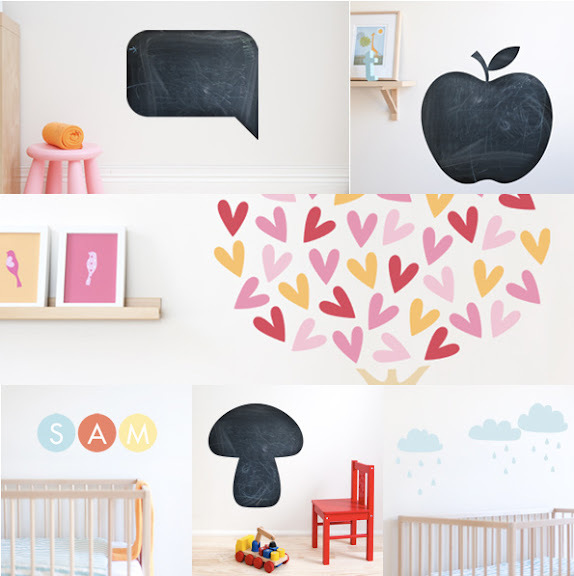 They specialize in eco-friendly wall stickers and decals and as you can see from the above images, they are simply adorable! I'm particuarly fond of the toadstool--it would've been such a fun addition to E.'s Woodland Fairy Party way back when. But truly, there is so much to love on the site and you could easily plan an entire nursery, bedroom or playroom around any one of their modern, fresh designs. I'm so happy to see something that I can actually purchase! I was just looking at wall decals the other day. I love the blurb decal so it looks like a quote being spoken...very fun! Wahoo! I'm so happy for you. They do have really cute decals. You could get pretty creative with some of them outside the nursery even!